Prime Minister Viktor Orbán has told his US-based diplomats that he wants an invitation to the White House. Let’s face it, the Hungarian strongman is a bit insecure. Orbán has ruled Hungary with an iron fist since 2010 yet he couldn’t secure a photo op with a sitting US president in the Oval Office. The Hungarian Prime Minister thinks that an invitation would solidify the legitimacy of his policies and increase his personal credibility among fellow politicians who tend to shy away from him. The previous Hungarian Ambassador to Washington, Ms. Réka Szemerkényi, worked vigorously on this project, yet she was unable to secure an invitation despite the fact that Orbán was the first EU Prime Minister to endorse Trump. Now we have a new Hungarian Ambassador in Washington. Mr. László Szabó is telling the Hungarian public that Trump respects and appreciates his boss and the invitation is coming soon. 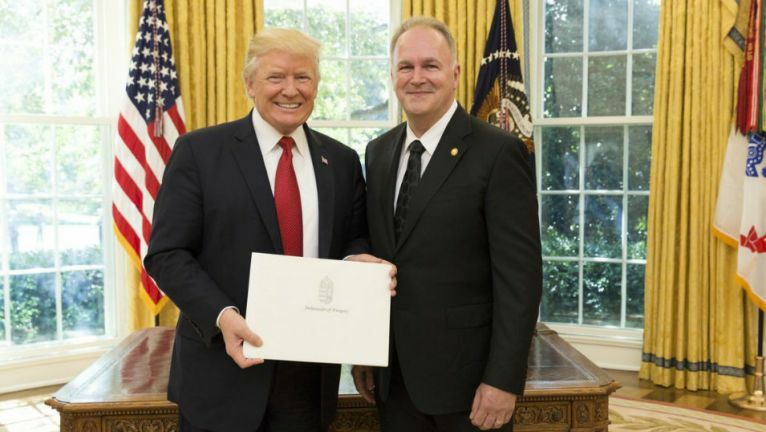 President Trump and Ambassador Szabó (right) in the Oval Office. Ambassador Szabó published his “conversation” with Trump in the Hungarian pro-government newspaper Figyelő. As it turns out, Trump met 12 ambassadors on that day, 10 minutes each. Szabó was the second which according to Szabó was a “sign of respect towards Hungary.” Of course I wouldn’t be surprised if President Trump had characterized the other 11 country’s leaders as “strong and brave.” Planted stories like this one actually tend to backfire; Trump hates when his personal conversations are leaked to the media, especially when they are incorrect and out of context. No official confirmation yet from the White House that Mr. Orbán is on any guest list in the foreseeable future. It seems that Ambassador Szabó committed a diplomatic faux pas. Are you sure that “Orbán has ruled Hungary with an iron fist since 2010”? I cannot recall that he ordered the police forces to fire on the protesters as Mr. Gyurcsány did. Where is the “iron fist”? Lies again – unlike Orban with his mafia state, PM Gyurcsány did not order anything, the police acted in response to (the Fid organized) violence under the command of the Budapest Superintendent Gergényi. Notably Fid (stooge Peter Polt) charged Gergényi in relation to his handling of the riots and attempted to coerce false testimonies implicating the PM, but failed. Like the egoistic authoritarian ruler of any inconsequential and small country, Orban is looking for the usual “stamp of approval” from the Oval House. Except that this time, the Oval Office is occupied by someone who rather compromises than bolsters or affirms the integrity of his guest. I wouldn’t say “iron fist”, Orban staged an incremental constitutional putsch and his quasi fascist regime has been tightening the screws all the time. We’ll get to the stage of iron fist, I’m afraid within a year. Ok Robert, you made us smile again with this 10 years old b.s. , although you are somewhat right, “iron fist” is not the best description of the dictator’s arsenal, which is much more colorful. And you also believe in that the stork brings the baby. “Ok Robert, you made us smile again ……” I am so happy to read this. After all this whole skirmishing is nothing more than a cabaret. Neither the article nor the comments make any difference in the relationship of Hungary and the USA nor in the interior politics of Hungary. But at least we have fun, don’t we? Yes indeed he does. And so far the ship is sailing in the right direction at the right speed. Hopefully nobody can hijack it before reaching the “Bay of Freedom from Soros and his cronies”. I am not really concerned about the content of a six years old article. If I had any statement about it that would be a remark on the manipulative nature of the insertion of this link into your comment. The article was published by Joó Hajnalka on 2011.08.25. at 8:53. If you ever be able to separate your comments from the brochures and take the trouble to look into historical facts than you would understand the paradox of your statement “his quasi fascist regime”. I suggest you study the history of fascism, learn who and when created the ideology (and the word itself), who was one of the first “leaders” congratulating and endorsing the idea, who practiced it in real life, who converted it into a different meaning and who and how use it these days for what purposes. You could not avoid seeing the parallel with the racism in the USA which was originating from and being always practiced by the democrats (Hillary’s super predators comment) but used against the republicans to get the votes of the subjects of such racism. There was a very compelling trace of racism during the 2016 election process when all liberal media continuously measured and published the potential black votes. How could it be without poling people based on their race? Wake up Observer, life is beautiful without the pink glasses too. Orban is an accidental fascist and his regime is a quasi fascist one, i.e. “fascist light” so far and my opinion is based on my studies of history and that of fascism (e.g. The Origins of Totalitarianism, H. Arendt, Anatomy of fascism, R.Paxton, Mein Kampf, etc etc). If you have any interesting reading suggestions, pls advise. Orban is not ruling Hungary with an iron fist. He is ruling with the consent of the Hungarian electorate, which elected him twice, not because they are manipulated, not because they are intimidated, but because they saw the economic disaster left by previous government, which Hungary is still working through and they decided they do not want a repeat. Orban may have his faults, but on the economy, on migration, he largely got it right. All this “Viktator” stuff is not going to stick, given this fact. Not to mention that given policies in places like the US and in EU countries, which are authoritarian, such as anti-terror laws that are in fact used to mass-eavesdrop, to arrest without due process, and so on, there is really nothing going on in Hungary that is any worse than any of this. As for media freedom, how about Germany? Took their national media five days to report on the fact that 1,200 women were molested in one night, while now Facebook is being intimidated into pretty much erasing anything anti-migrant through the threat of huge fines. As for the Trump invite, I am sure if Orban were to do like Romania’s president and sign billions of dollars worth of weapons contracts, he would get an invite as well. I’d rather Orban abstain from doing so, which I am sure he is smart enough to do. Hungary has been dropping back against all EEuropean countries and many EU averages too, e.g. – Hungary has had the lowest GDP growth in the region (except Austria) for the last 8 years. – 63% of the households have only ONE MONTH worth of financial reserves (just came from the Jannisar university study).